South Park? I was aware the area existed given the ever-so-popular North Park, but I have never been to a restaurant there before. We had the opportunity to venture out to South Park when our good friends, J and J, bought a cute house over there. A group of our friends met at their house for a tour of their home and of their neighborhood. We walked to the Station Tavern and Burgers, their family friendly suggestion, for lunch on a weekend afternoon. I was curious to see a beer tavern that is family friendly. The restaurant set up is similar to the Lei Lounge, where the bar and half of the seating is inside the restaurant and the other half is outside. 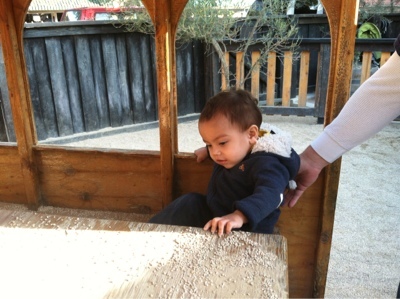 They also have a cool wooden train for toddlers and/or youngsters to play in. The train is enclosed in a gated area and instead of sand, there was gravel instead. I love restaurants with a simple menu. The Station Tavern definitely has one. They serve burgers, fries, tots, and have a small kids menu (an all beef hot dog, grilled cheese sandwich, or a tofu dog for $3.00 each). Burgers are reasonably priced ($6 or $7), but do not come with fries or tots. The menu shows that they have local beers on tap, wine and cocktail list. J took the liberty and ordered one full order each of the regular french fries ($3.50), garlic fries ($4.00) and sweet potato fries ($4.00) for the entire table. They ran out of tots... WHAT? The server brought out the fries before our burgers. I would say that a full order can feed about three people (two really hungry people). The french fries were simply what they were... french fries. Nothing special about them. They were crispy and salted nicely. J warned us that the garlic fries are *really* garlicky. I absolutely love the taste of garlic, as long as the garlic is not raw. I helped myself to these first. The menu description describes that these are tossed in fried garlic but it was not. 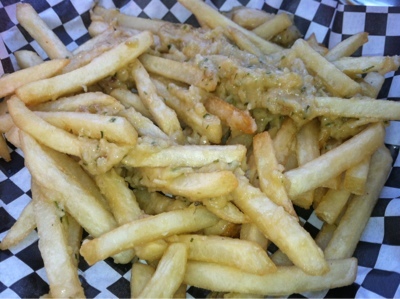 I was expecting the chunks of sauteed garlic and parsley fries similar to Gordon Biersch. 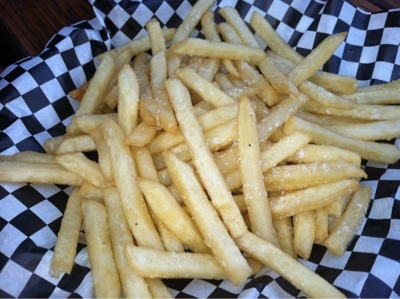 These fries had sweet chunks of roasted garlic slathered on top, which was super delicious. Every bite of the sweet garlic made me want the taste even more. 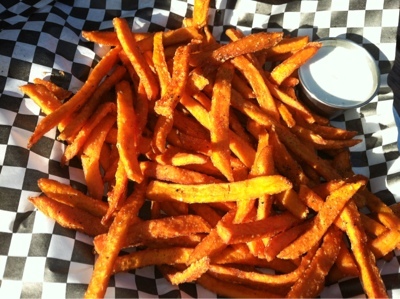 The sweet potato fries were exactly what I expected, but I LOVE them so they were scrumptious. These fries were served with a bleu cheese sauce. Our burgers arrived at the table and unfortunately, between our son running around the restaurant, me being really hungry, and trying to cut up our son's kids all beef hot dog ($3.00), I only took a picture of my burger. The hubby ordered the turkey burger ($7.00), everyone else ordered cheeseburgers, and J ordered a the Yardbird (grilled chicken sandwich - $7.00). I'm a cheeseburger gal - simple dimple. 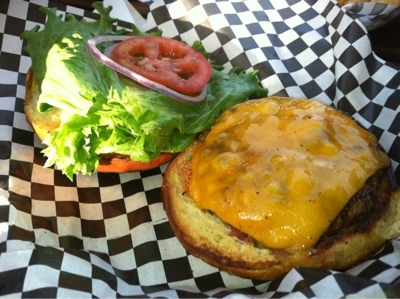 The cheeseburger ($7.00) is made with 1/3 pound Angus beef chuck and comes with the usual lettuce, tomatoes, red onion and pickles on a toasted bun. We had a choice of cheddar, swiss, or pepperjack cheese. Burgers did not come with any sauce. There were condiments on the table or you can pay $0.50 for one of their many homemade sauces. The patty was a tad smaller than the bun, but I did not mind because the bun was soft, fresh and perfect for my medium temperature cooked burger. The flavor of the meat was good. It was well seasoned and it made my tummy happy. All in all, the Station Tavern is a great family place - there were tons of kids and babies - AND a great place to grab a burger and a brew with your buddies. I really want to go back to try the tater tots, garlic style. South Park has all these hidden gems, like a cupcake/ice cream place, this popular mariscos food truck in the grocery store parking lot, Whistlestop Bar and MIHO gastrotruck every Friday evening, Big Kitchen (which I have never visited) and a cute French creperie. We are definitely visiting South Park again to explore! hi there! south park has changed over the years. it's nice to see the area thriving with new businesses. 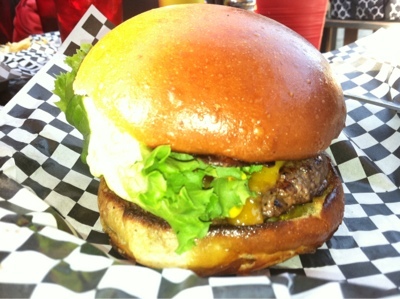 station tavern is great - i had their salad with a burger patty last time. the french cafe you mention is cafe madeleine which has excellent crepes and paninis. it's also steps away from a cool mural of a monk by shephard fairey. the ice cream place, daily scoop, uses ice cream from niederfranks (local to national city). the area is really walkable, filled with cool little shops (i like bad madge, the make good and junc - they're all right next to each other), eateries, and such.